I just went through T-TESS and tried to add everything that is required per lesson, then made an easy to follow template. 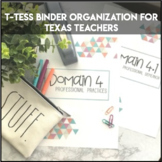 T-Tess Organizer part 2 documentation forms EOY Summative Conference made easy! The T-TESS Domain III: Learning Environment Walkthrough Template is designed to be printed on front to back to accommodate four walkthroughs on one page. Easy to use clear template leaves no room for error. The T-TESS Domain I: Planning Walkthrough Template may be used as a means for documentation of teacher walkthroughs conducted by an administrator. The form is designed to be coped front and back to offer more per page. Standard PDF. The T-TESS Domain II Walkthrough Templates include all five dimensions in a two page format for double-sided printing. There are two pages for each dimension so that they may be printed front and back for easy use. This template helps in meeting the Accomplished to Distinguished goal of Dimension 1 of the T-TESS rubric. This monthly school year calendar is color coded for block scheduling A/B days. This completes the Ttess organizer available in 3 parts. The first two parts can be reused from year round year, but the calendar will need updating each year. T-Tess Domain 3.3 - Classroom Culture Descriptors and look-fors for the classroom culture domain. A checklist to help create an evidence binder for Domains I-IV.